(NaturalNews) Biotech companies such as Syngenta and Monsanto have more on their agendas than simply peddling poisonous GMO Frankenfood technology to us; they want to own and control the entire food supply, both genetically modified and otherwise. Many people don't know that these agricultural tech giants are also involved in the business of patenting non-GMO plants and seeds. It's all part of their sinister plan to own the patents on all of the foods we eat. In the United States, what was once a diverse and essentially free exchange of seeds among farmers and home gardeners has become a giant industry. 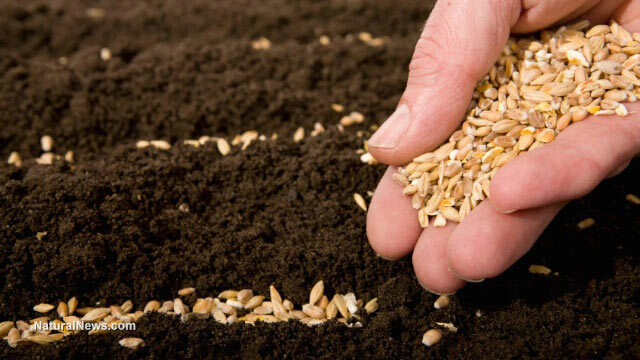 The history of seed development, distribution, and ownership reflects today's dominant economic paradigm of the last several decades, which converts basic elements of life – such as seeds and genetic resources – into private, commercial assets. Until the last few decades, seed development and distribution in the U.S. was largely under the purview of the public sector and augmented by hundreds of small, often family-run, seed breeder businesses, which acted mainly as distributors of publicly developed seed varieties. This contrasts sharply with the situation today in which the top ten companies control 65 percent of proprietary, or intellectual property (IP)-protected, seed. In Europe, the patenting of non-genetically altered plants is prohibited by law, yet patents are now being routinely issued for conventionally cultivated varieties of seeds, setting precedents in favor of Big Agriculture. The trend is towards the privatization of the things we need to survive, namely water and food. Whoever controls these elements has great power. The populace needs to become aware that companies such as Monsanto and Syngenta are looking forward to a world in which they hold the keys to our survival. One recent example of how this works is the case of Syngenta's patenting of a pepper strain obtained through conventional breeding methods. The European Patent Office (EPO) granted the patent for use "as fresh produce, as fresh cut produce, or for processing such as, for example, canning." The patent also covers the plants, their cultivation, harvesting and seeds. The plants have been developed to produce pepper without seeds and are derived from conventional breeding using existing biodiversity. There was no genetic engineering involved in the process. This type of patenting of conventionally bred plants and seeds is on the increase, although some of Big Ag's patent attempts have been successfully challenged. For example, Monsanto was originally successful when it tried to patent a tomato it claimed to have developed, but patent #EP1812575 was revoked when it was proven that Monsanto did not create the plant's natural resistance to the fungal disease known as botrytis. Monsanto's clever lawyers created wording in their patent application to give the impression that the seed was genetically engineered to produce this quality. They made the tomato look their "invention." This is essentially biopiracy. Through the efforts of the international coalition called No Patents on Seeds! and other concerned activists, the efforts of Big Ag are meeting some effective resistance. However, these groups need the support of the population in the fight against the big boys and their nefarious plans. The recent move towards GMO bans in Europe are an indication that the industry giants can be successfully challenged. Now it's time to put an end to their efforts to monopolize our natural seed resources. No company should hold monopolies on sunlight, air or water. The same is true for the resources needed for food production.